Q. How do I delete titles from Bluefire Reader and return enki titles early within the Kindle Fire? With BlueFire, you can return an eBook early. Tap the Library button in the Main Toolbar to view a list of the items that have been added to Bluefire Reader. Go to the List View. 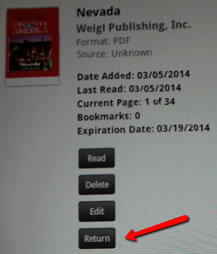 Select the eBook that you would like to return.